Let’s get Leon Adopted! 3 year old Belgian Shepard, Sheepdog, German Shepard Mix. Over 1 year in the shelter. Meet Leon, a Belgian Shepard, Sheepdog, German Shepard mix. Isn’t he a gorgeous boy! He’s been looking for his forever home for over a year now. He shouldn’t have to spend his young adult life in a kennel. Leon did have a very good start to life. As a young dog he survived on his own for months until he was captured in a humane trap, by the dog warden. 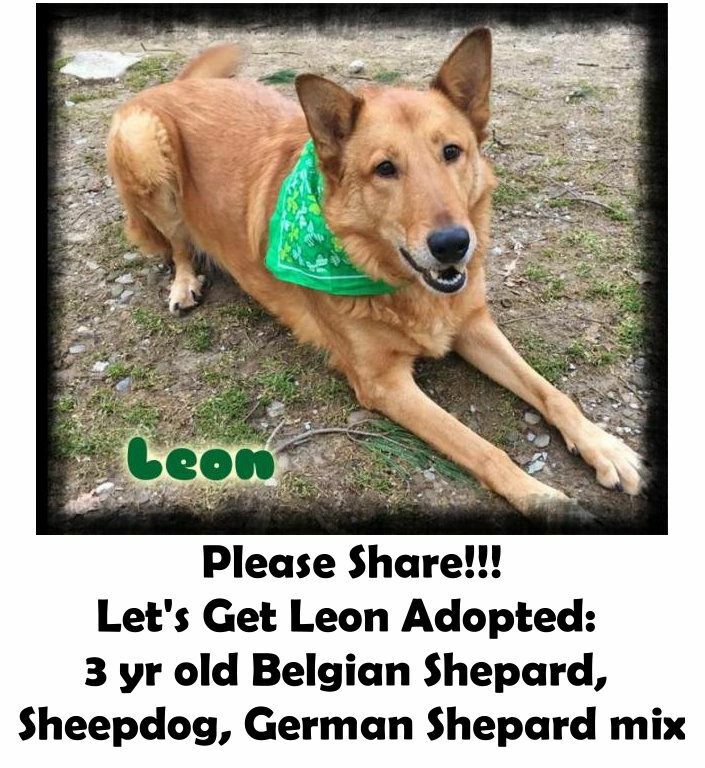 He was then taken to Tri-County Animal Rescue Center in Shippenville, PA.
Leon has a deformed rear foot, that he sometimes favors, and doesn’t use, when he’s out playing in the play yard. But it doesn’t slow him down at all. Once Leon gets to know, and trust you he is a perfect gentleman, taking treats gently, getting hugs and rubs. He likes to play fetch with his ball. He comes when he’s called. And Leon is a quiet boy in his kennel. However, Leon is a real diamond in the rough. He can be a bit loud, jumpy and rather boisterous when meeting new people though. You likes to save his best behavior for those he loves. Pretending to be a lion needing taming, rather than the good boy he really can be. He needs a patient, understanding forever person or family willing to work with him to earn his trust. To be patient until they get to see his best behavior. Someone willing to visit him regularly before taking him home. The forever family willing to work with this young boy will be richly rewarded with the love and devotion of a very handsome, smart and playful dog. Adopting a pooch with a little quirk is so rewarding! It’s like they know someone saw something special in them and they are so expressive about their love for that someone. Our Charley has her left pelvic bone fused to her spine from the lower T vertebra to S vertebra. I didn’t know it at the time we adopted her, but I did know about her HD. I loved her from the moment I saw her, so none of that mattered. I hope handsome Leon has been adopted already! Wonderful that you adopted Charley! I’ve never heard of that type of problem. Our Monkey came to us with a broken neck, two bones that should have been fused weren’t, as a foster dog, and we knew we couldn’t let her go to just anyone. Unfortunately, Leon is still waiting for his perfect forever home. Like so many others. I’d never heard about the problem Charley has either, apparently it’s a birth defect. Charley’s hydro therapist always says, they end up with the people that will be the best for them!